"Dragon Knight Draco-Equiste" has super-high ATK and many powerful effects. To Summon it, you'll need to do a Synchro Summon, then a Fusion Summon. 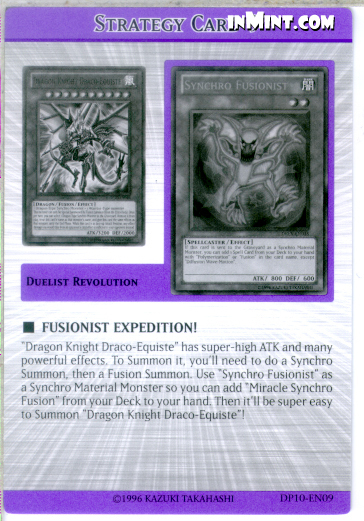 Use "Synchro Fusionist" as a Synchro Material Monster so you can add "Miracle Synchro Fusion" from your Deck to your hand. Then it'll be super easy to Summon "Dragon Knight Draco-Equiste"!